The Netherlands government is to sponsor political parties in Ghana with a package of over ¢10.2 billion in the run-up to the presidential and parliamentary elections in December. The funds, to be provided through the Netherlands Institute of Multiparty Democracy, will be used to buy airtime on some selected television stations, where the parties will be made to air their messages to the electorate. Other activities to be considered will be the buying of airtime for political broadcasts and debates, among other things. The Netherlands Ambassador to Ghana, Mr Arie C.A. van der Wiel (pictured), disclosed this in Accra yesterday. He was speaking in an interview to commemorate the celebration of the Netherlands National Day, which is also dubbed the Queen's Day. The day is considered the most important day on the country's calendar and is also observed as a national holiday. Mr van der Wiel said the Institute of Economic Affairs (IEA) would be used as the administrative extension of the institute in The Netherlands, since the institute has no official offices in the country. The move is a welcome relief for the political parties, since it will bring to rest heated arguments over the allocation of airtime by particularly the state-owned media to the parties in opposition to make their programmes known to the electorate. The Ghana Broadcasting Corporation (GBC) has already met with the political parties to discuss ways of providing equal airtime to broadcast their programmes and activities. Mr van der Wiel said it had always been the desire of the government of The Netherlands to contribute significantly in diverse ways to the growth and sustainability of Ghana's democracy, since it serves as a shining example to the rest of the countries on the continent. "We believe in creating a culture of greater accountability and transparency, improving the culture of dialogue and, above all, respect for on another's views", he added.He said the assistance to further consolidate the country's democracy would focus on the capacity building of the political parties, while support would be given to civil society organisations in research and advocacy. 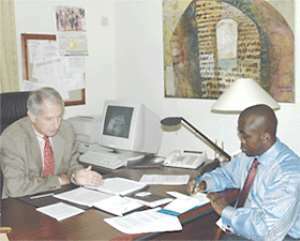 He commended the Ghana government for becoming the first to submit itself to the Peer Review Mechanism under NEPAD and expressed the hope that other African countries would emulate it.In the area of peacekeeping, Mr van der Wiel said Ghana's efforts in regional conflict resolution and management had received high international appreciation, The Netherlands not being exception. "We consider Ghana as a key player in the regional integration process including the establishment of a common economic market in West Africa,” he added. Mr van der Wiel announced that at the end of next month, The Netherlands Minister of Foreign Affairs responsible for European Affairs would visit Ghana to sign a memorandum of understanding (MOU) for the preservation of mutual cultural heritage between the two countries. He said The Netherlands government was committed to improving historical sites in the country, particularly the Dutch castles, to attract more tourists to fetch some more funds for the development of the country. He paid glowing tribute to Queen Beatrix, who succeeded her mother some 24 years ago, and indicated that her contribution to the development of that country in all aspects would always be remembered.